What’s Credit Risk Telling us about the French Elections? U.S. Stocks? Join our Larry McDonald on CNBC’s Trading Nation, this Wednesday at 2pm. Political shifts have been the biggest driver of global equity market returns over the last 18 months, U.S. equity investors must keep an eye on Paris in 2017. As we head into the election season in Europe, we believe the French elections (April 23 & May 7) will offer investors a buying opportunity. We fully expect either François Fillon or Marine Le Pen will be the new French president. This means a shift towards more domestic economic growth and lower regulation and taxes. We believe French equities are…..
Join our Larry McDonald on CNBC’s Trading Nation, Wednesday at 2pm. Where are bond yields going with risk of a euro breakup on the rise? Click here (above) for our latest report. Wall St. spent the last sixty days piling investors into Trump “reflation” trades, now the new administration is making the crowd look like they are way ahead of themselves. There are a number of secular forces the street has misjudged as we head into 2017, the road to their beloved “reflation” trade is filled with pot holes. Crowded reflation trades revolve around a strong U.S. dollar, higher bond yields and inflation. It’s been unanimous, Wall St. is convinced of swift legislation coming out of Washington which will support U.S. economic growth. The equity market has been priced for perfection relative to the high execution risk. We have no doubt this reflation trade is coming, just not on the fantasy time line Wall St. has promised. With nearly 50% of S&P 500 sales outside of the USA, the Trump administration wants to stop the bleeding. Late Monday, the U.S. dollar fell to the lowest level since December 8th after Treasury Secretary to be, Steve Mnuchin’s remarks were published. The Bloomberg Dollar Spot Index fell to a six-week low after Mnuchin said an “excessively strong dollar” could have a negative short-term effect on the economy. Futures on the Nikkei 225 Stock Average dropped after the yen rose by the most since July. Energy and industrial shares led the S&P 500 Index lower, though equities finished above their session lows. European shares fell to the lowest level of 2017. McDonald’s Corp. and Halliburton Co. declined after results disappointed. Gold rose to the highest since November. Ten-year Treasury yields fell a second day, Bloomberg reported. The U.S. dollar extended declines after Treasury Secretary nominee Steven Mnuchin raised concerns about the currency’s strength. That came as stocks slid and Treasuries gained after President Donald Trump targeted reworking America’s trade relationships. Trump and Mnuchin know a strong dollar will punish America’s middle class, something they’ve pledged NOT to do. 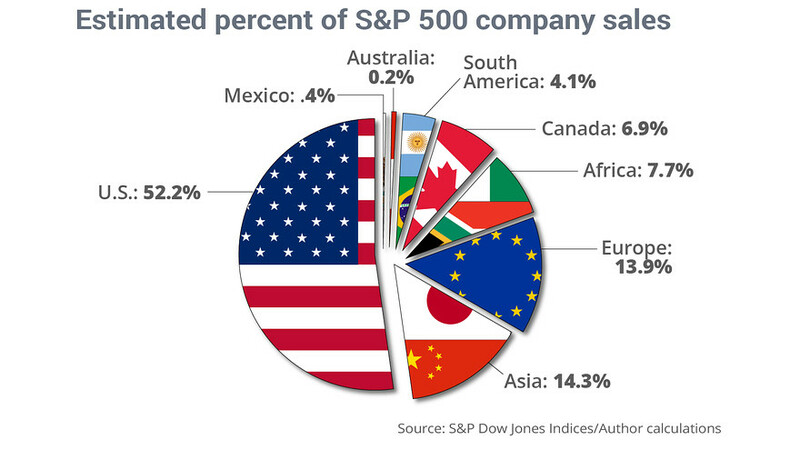 Nearly 50% of sales within the S&P 500 (America’s largest companies) coming from outside the USA. A strong greenback makes U.S. products overseas much more expensive, this hurts job creation in the USA. What’s Driving Bond Yields Higher? As President-Elect Trump becomes President, bonds have given up their 2017 gains recent days. The question is, whats driving the move? To get our latest report on where bond yields are headed, click on the lick above. As yields have headed higher over the past few days, much as been blamed on Fed Chair Janet Yellen’s more hawkish tone and growth excitement with regard to the President elect. We think there is another element that is very involved in the yields move, this weeks survey results. “Survey” is the key word, not based on economic data but on survey’s of business sentiment. We look at the Philadelphia Fed Manufacturing Index as an input into our ISM (Institute of Supply Management) model. Not only is the headline correlation strong, more so than other regional survey points, but also the sub indexes have a strong statistical relationship. The headline number continued its post election strength to 23.6, highest level of the year. Sub indexes such as new orders and employment indices moved decisively into growth mode. The index also has a pretty strong correlation with 10 year U.S. treasury yields. We believe, there was a specific section that the market was taken a back by, the “prices received” section. This showed that companies expected to be able to pass on any increase in prices to the consumer, an inflationary sign. This puts a lot pressure on bond prices, has created an opportunity. We’ve rarely seen a trade this crowded, sentiment so one sided. The most important figure in the Philly Fed report, with regard to the market, was “Prices Received”, which also made a new high. This suggests that businesses are starting to pass on higher costs to their customers. The bond market was repricing this, especially at the longer end. We still believe much of this is sentiment driven, but it is worth paying close attention to in coming months. However, as positioning is so one sided in bonds, much of this inflationary acceleration is priced in. Markets Overreact to Mnuchin’s Comments on Recap and Release? The rule was one of the core components of the 2010 Dodd-Frank Act, and its strict limits on banks betting with their own money was meant to keep Wall Street from taking dangerous risks and acting against their customers. Mnuchin endorses strong dollar in “long term”. Distances himself from “recap and release” of Fannie and Freddie, but won’t say how he would deal with them. Supports continuing to enforce Russian sanctions. Wants to boost headcount at IRS and update technology. Called for a “21st Century” version of Glass-Steagall. He supports the Volcker Rule in general but says implementation needs to be improved. Went out of his way to talk about cutting regulations that hurt community and small regional banks. Wants to preserve the CFPB, but fund it out of general budget. Chinese holdings of U.S. Treasuries continued to plunge in the month of November. There was a sharp $200B drop in the second half of last year, market participants have been waiting to see what Beijing did after the Trump election. The answer? Sell. China‘s U.S. Treasury Securities Holdings fell to $1.049 trillion in November from $1.116 trillion in October. Much of the vicious sell off in bonds through the month of November was thought to be due to the “reflationary trade” environment. Wall St.’s been pricing in a Trump administration running up deficits and more pro-growth legislation coming out of Washington. The narrative plays well in the press, but in reality a lot of the selling is pointed at the Chinese raising emergency cash. Since June of 2016, the Chinese have been aggressively selling U.S. Treasuries in order to raise cash and defend their currency, the yuan. This has been a huge catalyst for the bond sell off in Q4 2016. Since April, the currency (yuan) has devalued by 8% through December 2016, as cash has been pouring out of the country. China has spent billions trying to prop the currency up, defend her. U.S. Treasury data show the country has dumped about $270 billion of U.S. government debt since its holdings peaked at $1.32 trillion in 2013 and is using the funds to underpin the yuan and stem capital outflows. The question is, does it make sense for China to keep selling treasuries at such a fast level? We think not. By selling treasuries, the Chinese are only sending yields higher in the U.S. which supports a stronger Dollar, something the Chinese cannot afford. A big question for 2017 will be, do the Chinese continue selling off treasuries, or does the fear of further depleting reserves and raising the Dollar put them off. Pick up our latest report, just click on the link below. Foreign holdings of U.S. Treasury debt totaled $5.9 trillion, a drop of $96.1 billion from the previous month. That was the lowest since 2014. In today’s moving speech, Mrs. May stressed Britain’s determination to regain control of migration from the European Union and rejected the supremacy of the European Court of Justice, even at the risk of losing unfettered access to the single market and its nearly 500 million consumers. Just when Wall St. told you to “get out of bonds” we’ve experienced one of the most significant rallies in recent years. As bond prices rise, yields move lower, 32bps in 24 days is impressive indeed. The weaker Dollar, stronger Pound is helping today. “I want to be clear, what I am proposing cannot mean membership of the single market. European leaders have said many times membership means accepting the four principles” of the EU. Theresa May’s speech is moving markets as expected. It’s important to note, Parliament will be voting on the terms of the Brexit, life after Brexit. Prime Minister Theresa May on Tuesday set a course facing a clean break with the European Union after more than four decades of integration with the Continent. Positioning in the Pound has been one sided for much of the last 6 months. Considering this, speculators have seemingly done a bit of short covering on the back of the news that the British Parliament will have a final say. Today’s rally is looking a like a sell the rumor buy the news event, as the Pound has become very politically driven. The U.K. parliament will get a vote on the final Brexit deal before it is implemented, Prime Minister Theresa May said, as she tried to offer business some certainty about its future. Bears have been driving the pound heading into May’s speech, cover (shorts) on the news is in play today. Newsletter writers in the “bullish” camp according to Investors Intelligence fell to 58.6% from 60.2%, this broke an 8-week string of gains which began at 41.7% in early November. A BIG however, Bullish sentiment remains above 55%, clearly in the “danger zone” for a market roll over. In 2014,15 and 16 investors were far better off holding cash levels high in January and putting money to work once fear returned to markets in the middle of the year. We are in this camp for 2017. The last time there were this few bears, U.S. equities plunged nearly 13%. We advised our clients to buy stocks aggressively in February (click the link below, we’ll send you the reports) and June of last year, today the risk – reward is NOT attractive in owning stocks. Bears slipped to lowest since Aug. 2015 to 18.3% vs 18.4% last week Correction rises to 7-week high 23.1% from 21.4%. The bottom line, those who beat the market in recent years were buying stocks while others were running away from them. As you can see above, as the bears in peaked in February, stocks bottomed.